Personalising your eDMs improves open and click statistics according to studies done by leading marketing companies. MarketingSerpa is one business that works tirelessly at mining data to assist marketers. It justifiably presents itself as a ‘research institute’ so what has it found out on the use of personalisation in eDMs (email marketing messages) campaigns? A study in July 14 conducted on B2B businesses confirmed personalised eDMs improved statistics and conversion rates. Personalisation takes on various forms – it’s not just adding in the first name on eDMs. The use of the [first name] definitely improves the open and click rates and when it’s also used in the subject line the statistics look even better. However it’s a balancing act too – i.e. there is such a thing as too much. Mixing up your personalisation in your eDMs is vital. Use of the [first name] in the subject line needs careful deliberation i.e. depending on your eDM campaign volumes not every eDM would have the first name personalisation in the subject line. Reviewing your campaign statistics regularly will provide the guidance you need to gauge what works for your business. If your unsubscribe rate is increasing and statistics dropping you’re probably overdoing the use of personalisation. First impressions count as we know and your business has the opportunity to create a lasting impression on every new email marketing subscriber. When a person subscribes to your email marketing list a series of eDM campaigns can be delivered to the subscriber over time. Offering a free eBook or service by way of an introduction to your business creates a standout first impression. Providing a quick survey ‘seek to understand’ your new subscriber also creates the opportunity to interact with someone interested in your business. Following on from the initial series of personalised eDMs more targeted marketing can occur and this raises your game and improves your overall conversion rates. 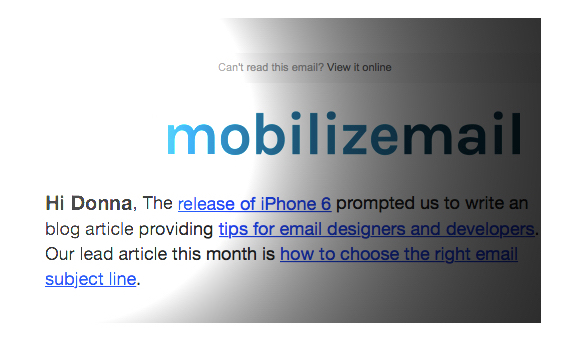 Contact us e: support@mobilizemail.com to assist you in setting up ‘personalisation’ in your Mobilize Mail account.